" Sliide Airtime is a new and ingenious way of funding mobile Internet access in countries where data charges are high. In Nigeria it will help overcome the problem of expensive data and gives advertisers a new method of targeting and reaching consumers with personalized content. 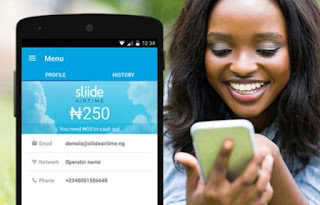 Sliide airtime was introduced in Nigeria, in March 2016, to provide users with an easy method to earn free airtime-- and discover brand-new material. When you unlock your phone, you will see the latest news and entertainment headlines from your preferred news sources, or a sponsored story or advert. - You can Sliide right to unlock your phone as regular. - You can check out the full story by tapping the 'check out' button. This will take you to the publisher’s website. - Some stories have a free preview so you can find out more of the story, for free, on your lock screen. - Tapping on sponsored stories and adverts will take you to their respective website. - You get free airtime/data just for using your phone as you usual do. - The quantity of reward you get can differ, as brand names pay various amounts to target various individuals and areas. You can get far more by referring your good friends to join Sliide Airtime too! - You can cash out your airtime/data, when you reach the minimum for you, from within the app, by clicking the 'cash out' ' button. Sliide Airtime is presently in Nigeria, South Africa and Pakistan, and still expanding to other areas. Sliide Airtime utilizes a small amount of data to give you news and gist on your smartphone lock screen - usually the app uses about 60mb of data each month. However remember, you get free airtime/data monthly just for utilizing the service! Usually our users earn significantly more free data than the app consumes each month. Sliide Airtime does not interfere with your lock screen or settings in any way. You will have the very same security steps as you had before you installed Sliide Airtime.